Long story short? I learnt the hard way. Imagine if this was you. Years of learning the tools of my trade. Thousands of dollars and many years spent gaining qualifications and experience in Australia and abroad. Awards won, scholarships granted, kudos given, feeling like a qualified professional who has earnt her place in the corporate and small business worlds. Months then investing in my small business, contractors to help design, develop and get my content online as a) a demonstration of best practice, and b) a rich learning resource for my clients so I could FLIP their learning (flipping the traditional learning experience so the ‘homework’ is done in class, and the ‘lecture’ is done before you arrive). You can imagine the anticipation I felt, finally getting my 20 years of experience out there into the world, ready to ‘Create Real Change’ in the lives of professionals world wide, ready to show the online overnight success business coaching cowboys, what QUALITY learning was all about. Complaints left right and centre. Confused clients unable to find the content they’re looking for. Phone calls and skype sessions trying to lead clients through the maze of 36 lessons to the one they needed to engage with. 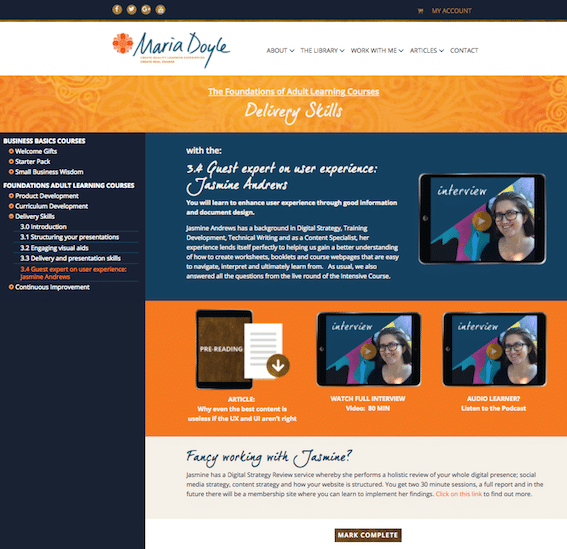 Prospective clients saying – look, I see your qualifications but I’m totally lost in your Library website – are you sure you know how to help me create one that is easier to use than yours? If that doesn’t demonstrate why good UI and UX is important, I don’t know what will. You see the quality of my learning materials was fine – but the way the website led you to engage with the content was NOT. The lessons themselves? Quality. Trying to find the lessons? Nightmare. My reputation as a quality learning experience consultant? Well, you make the judgement. Thankfully, I employed some developers who were across UI and UX and we got my website overhauled, STAT. Mission accomplished. Reputation restored. Fancy learning a little bit about how to improve your UX and UI, before your reputation ends up on the line? So what does UX and UI actually mean? Essentially, User Experience (how they find your site to interact with), and User Interface (the buttons and screens they need to engage with, to use your product). Because there’s a difference between being able to put together a quality learning experience, and being able to put it online in a way that’s easy to navigate, and it really doesn’t matter which way around you get it wrong – easy to find but terrible quality? Hard to find but great quality? It’s NOT going to leave your user with a good impression of your or your content, and your reputation will suffer. Here’s a quick example of what some UX and UI advice can do for the look, feel and user experience. Before and after some simple advice. A secondary menu for ‘in course’ navigation, icons to demonstrate resource types, just to name a few – can you spot any other differences? Which interface would you prefer to use? My top tips for not falling into the same trap I did? Top Tip 2: Ready to invest so you can create the Rolls Royce version straight up? Pay someone who is qualified in this area to do it once, and do it properly. Website designers are not necessarily UX and UI experts. Find one that is both. Ready to learn how to enhance user experience through good information and document design? Brilliant. I’ve got a workshop, and some online resources for you. 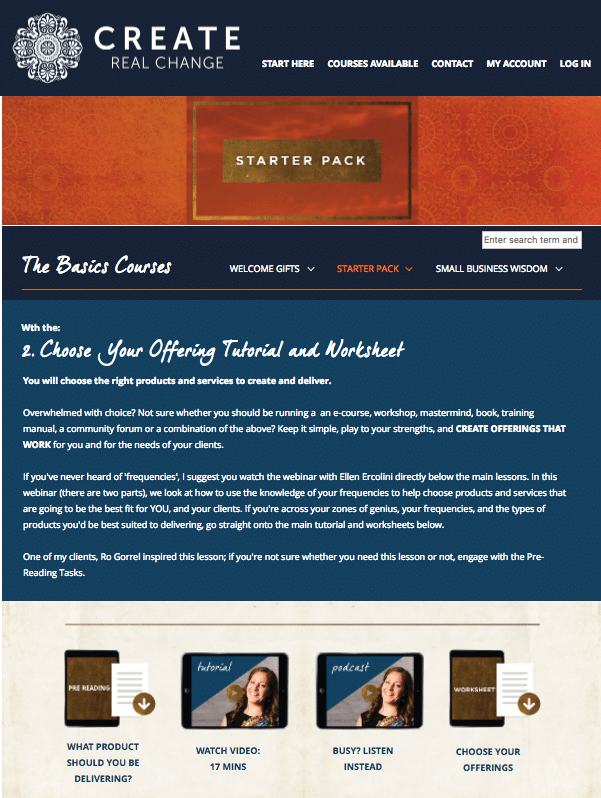 Here’s the online workshop information for you, and the online resources are below – there’s an interview with an expert in this field, Jasmine Andrews. Now for the online resources. I got together with Jasmine Andrews and prepared an interview for you. 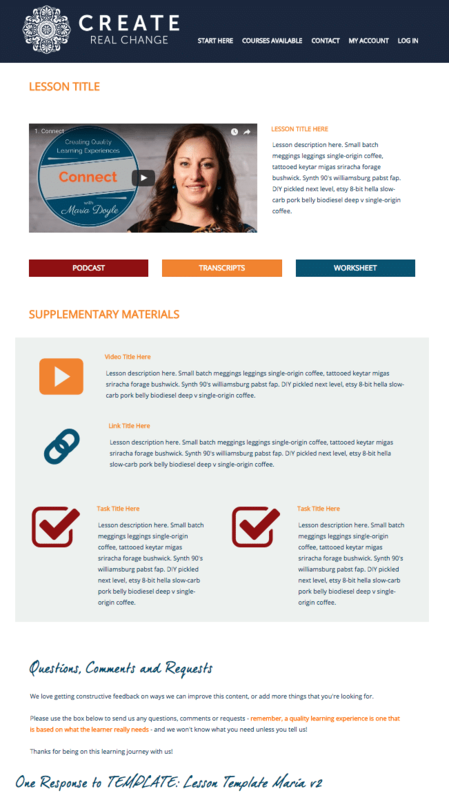 Her background in Digital Strategy, Training Development, Technical Writing and as a Content Specialist, her experience lends itself perfectly to helping us gain a better understanding of how to create worksheets, booklets and course webpages that are easy to navigate, interpret and ultimately learn from. ← How to give people what they actually NEED.